Harri was inspired to follow a route into academia after completing his undergraduate degree at Plymouth, and now works as a postdoctoral researcher. After graduation I remained in Plymouth as a research assistant, then as an enabler for students with disabilities at University of Plymouth while working in a bar on weekends. As an enabler I attended a great deal of lectures on a range of topics. I spent my free time applying for funding to continue doing research, published a paper from my masters, and in 2011 I began a PhD in Canada. I have since completed my PhD and I am now working in my dream job as a Postdoctoral Research Fellow with Professor Nigel Hussey and Lisa Loseto focussing on the movement ecology of coastal fish and interaction with beluga whale in the Canadian High Arctic. Immediately after graduation I battled to find funding to continue my masters research. This time was invaluable to my development; applying for funding is a big part of doing research and enables you to broaden your knowledge base. Bar work also helped with my communication and presentation skills. Working with my supervisor Professor Richard Handy to publish a paper from my masters gave me the boost I needed to secure a fully funded PhD in Canada (Fisk Lab) on an equally fascinating research topic. Not seeing family and friends for long periods of time following my move to Canada is one of the hardest things I will ever face. Although, I am very fortunate to have their support and encouragement despite the distance. My final PhD oral exam, in which distinguished professors asked me questions for several hours was very stressful and certainly helped my development. But conducting research in the High Arctic for my current position is both the most challenging and rewarding work I have ever experienced. I am fortunate to have had many exciting experiences, such as sampling the Laurentian Great Lakes for my PhD, a month SCUBA diving in Honduras with Operation Wallacea, and presenting at an invasive species conference in Oman. 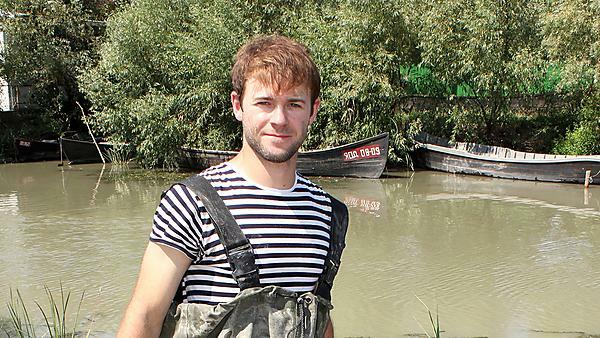 In 2013, I spent a month sampling the Ukrainian Black Sea drainage. It was fascinating, not only for the ecology and biodiversity, but also to visit a country on the verge of a revolution. In 2017 I was flown into an Arctic fjord by helicopter to help set up a nine-week narwhal and marine ecosystem research camp, then spent one month on a fishing boat in the open ocean between Canada and Greenland. These are very exciting times, but I am fortunate to have had many incredible adventures throughout my career and education. Including travelling the Laurentian Great Lakes to obtain samples for my PhD, SCUBA diving in Honduras with Operation Wallacea and presenting my research at a conference in Oman on the Arabian Peninsula. In 2013, I spent a month sampling the Ukrainian Black Sea drainage. It was fascinating, not only for the ecology and biodiversity, but also to visit a country on the verge of a revolution. I would ask more questions. For a long time I was too shy to ask out of fear of getting something wrong. I have since learnt that it doesn't matter. You will get some things wrong and some things right; if you don’t ask you won’t know. The interaction helps you remember the topic and the professor remembers you. Going down the research path requires serious dedication, but it can be hugely rewarding if it is what interests you most. Communicate with the professors; they will help you to find your focus and could end up being a mentor for many years to come. Find academics that do research in areas you are most interested, at Plymouth and elsewhere. Read widely (books and journal articles), keep a detailed research journal, and dream big. When I started a BSc in Marine Biology at Plymouth, I didn’t know if I wanted to be a marine biologist or what that would even entail. I just followed my interests. Studying at Plymouth inspired me to go for a career in research and provided me with a fantastic foundation upon which to build. To this day, memories of field trips and lectures with professors at Plymouth motivate me to continue on my path. My MRes supervisor Professor Richard Handy was fundamental in helping make a career in Marine Biology a reality for me. One of my favourite memories is from my first ever fieldtrip to Roscoff, France. At the end of each day we would be pretty exhausted, but the lecturers would have us all sit round as they summed up our learning experience. Professor John Spicer would read sections from John Steinbeck’s The Sea of Cortez. I vividly remember my exhilaration as he read from the book and the immediate verification that this was what I wanted to do with my life. Yes I would, especially a course like marine biology. Plymouth is an exciting and innovative university that is constantly growing and it is packed with successful academics. The city itself is an inspiring place to be, with all the maritime history, culture, and stunning coastline. When I visited on an open day, I immediately fell in love with the place. On one of the field trips during my undergraduate, I remember the lecturers stopping us as we crossed a bridge and telling us to look over the edge. After some time wondering what the heck we were doing, we started to see fish swim against the current and crabs crawl across rocks. Patterns started to form and questions started to role. Your time at university will fly by, so every so often take a moment to take it all in.